Remember, O most gracious Virgin Mary, and our wounded Mother that never was it known that anyone who fled to your protection, implored your help, or sought your intercession, was left unaided. Inspired by this confidence, We fly unto you, O Virgin of virgins, my Mother. To you do we come, imploring you to look on the Holy Church of God, your Son's Immaculate Bride, now defiled by sin, ravaged by wolves, betrayed by her Shepherds and Priests, becoming covered in the filth of the world, blinded to the Vision of her Spouse your Son, deaf to his teaching, by your own share in His Sacred Passion and by the sword that pierced your heart, hear our sorrowful prayers, bind up our woundsand wipe away our tears. 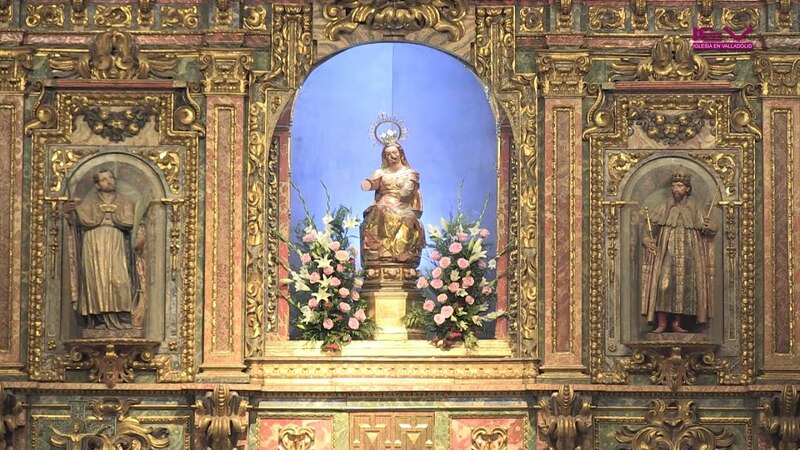 The Vulnerata, The Wounded One, was desecrated by English sailors in Cadiz in 1596, she was brought to Vallodolid in solemn procession by order of the King and is venerated in the Real Colegio de Ingleses, she is an apt reminder of the Church today. She inspired the Holy Martyrs of the College, may devotion to her inspire us. There she is, smiling serenely. She of all knows how true it is, "This momentary affliction is preparing for us an eternal weight of glory..." Ave, o Immaculate. Depreceris pro nobis!